Lisa has a Bachelor of Applied Science in Family and Consumer Studies and a Bachelor of Education in Secondary Food Technology and Health Education. She has accumulated 13 years of teaching Cooking and Cake Decorating in a variety of Victorian schools. 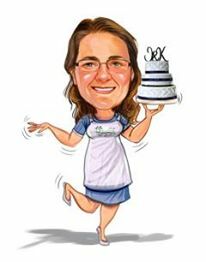 Her passion for baking and creating cakes then lead her to set up her own boutique Cake Decorating business in 2010. Contact Lisa today for a personalised quote for your wedding cake, engagement cake, birthday cake or special occasion cake.